Let’s start with art. An art object does not need pruning, watering or fertilizing. 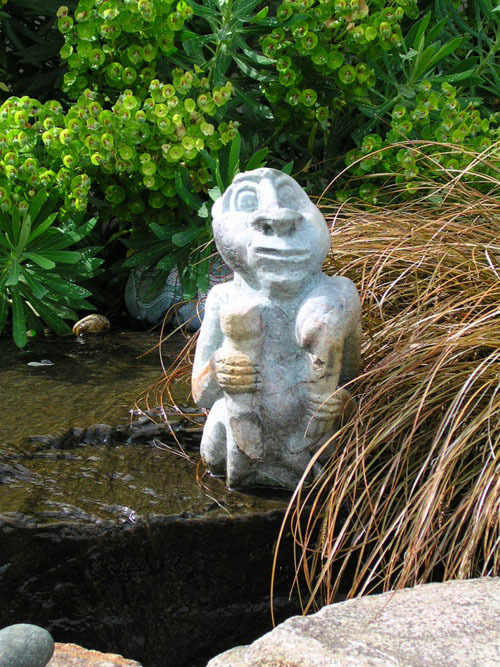 Art, particularly large art, is a way to get a powerful all season effect in the landscape. Place it so you see it from the most used room of the house. Add a little night lighting and really get your money’s worth. Shapely trees and large shrubs with attractive branch structure will make 75% of your most dramatic winter picture. Buy trees or shrubs already pruned and shaped beautifully. There are specialty growers who do this as part of their marketing niche, or hire a landscape gardener or an arborist to turn your trees and shrubs into winter beauties. Out here in the NW it’s Nancy Buley with Treephoria and while her plants are grown way out in east county she comes in to some of the farmers markets to make it easier for you to connect with her. 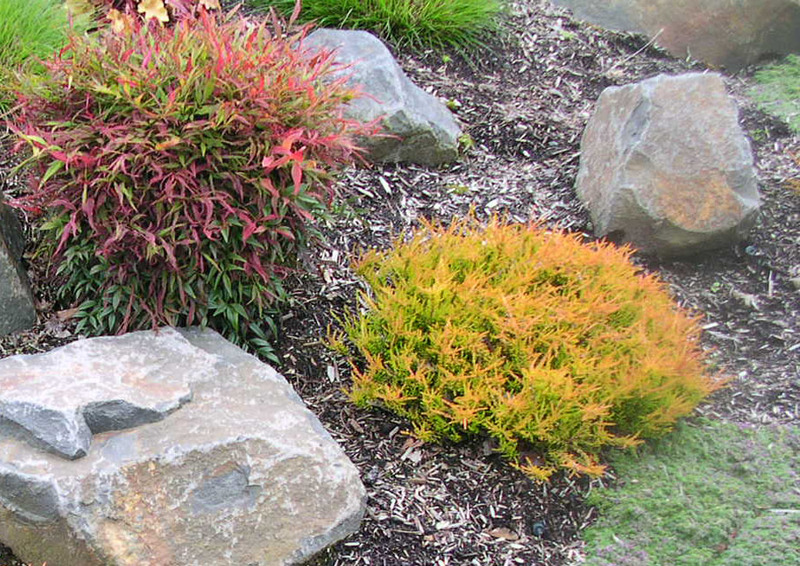 Here’s a series of shapely shrubs/small trees with cheerful bright winter flowers. My favorite of the chinese camellias is still Camellia Sasanqua ‘Yuletide’ but the growers have created a whole line of plants similar to Yuletide but in different flowering colors and different flower timing. Here are a couple of new ones I’m excited about. 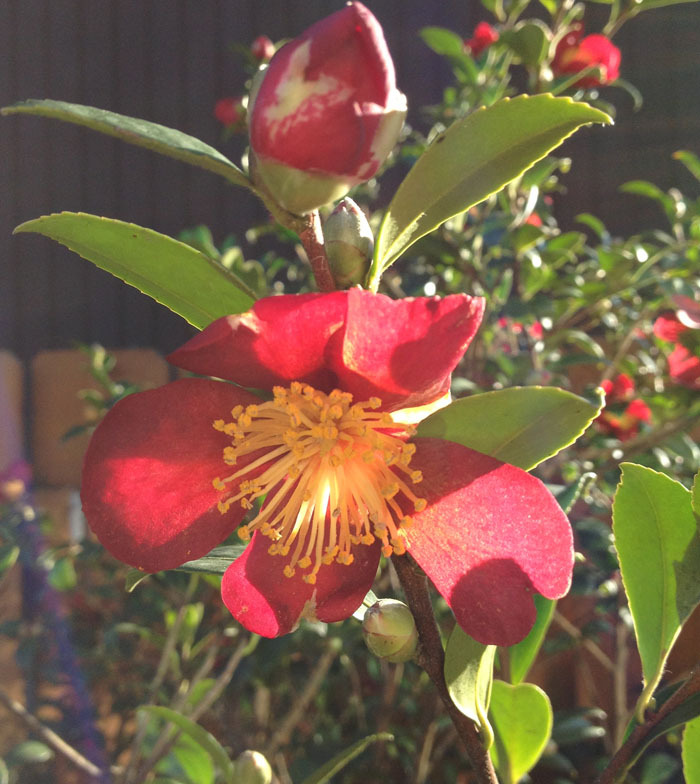 ‘Springs Promise’ a chinese camellia from Monrovia has an unusual orange red flower, a color hard to find in winter. The tree can be trained into a vase shape, an espalier or a thick shrub. We will see if the hummingbirds like it as much as they do the true red of the Yuletide variety. ‘Pink a Boo’ also has the smaller dark green glossy leaves (like Yuletide) but is that perfect frosty intense but pale pink. 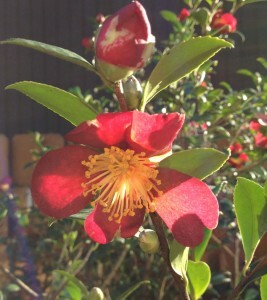 Camellia Sasanqua ‘Marge Miller’ is the only plant with a weeping shape. I’ve only used it once and am eager to get photos this January when my client Karen’s plant starts to flower. Calluna Vulgaris ‘Robert Chapman’ lights up in winter cold. To have a cheery winter landscape we need plant color low on the ground with a dark mulch or hemlock bark to dress the raw earth. Too much mulch or raw muddy earth looks unfinished especially for a front yard. In the back yard your dog will happily churn up that mud and bring it in so I like to see it covered. Many people here in the Northwest like to have the soil covered with plants to conserve water, lessen the chore of weeding and for style. Others find it too busy and want to see the space around the plants as part of the design. No one wants mud so we all agree on that. 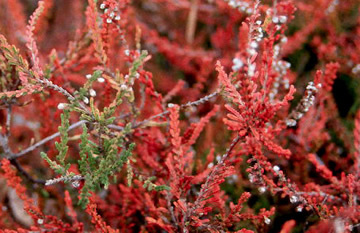 Plant selection: Use plants that turn on the color in winter cold. The foliage of heathers light up in reds, russets, ambers, and golds. 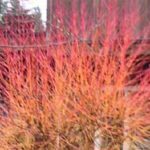 For a January pick me up, we cannot beat a red twig dogwood or scarlet willow, although planning for space is an issue with these plants. 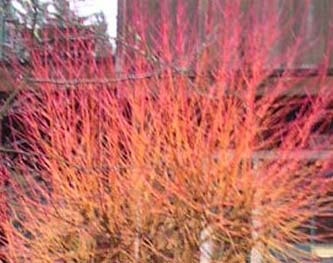 The twig dogwood shrubs and small trees light up in hot reds, burgandy and yellow. Notice what is going on outside. If you have become a person who never ventures out in the winter……give yourself a gentle little shake, put on some warm clothes and get out there and see what is going on. Slow down enough to notice light on the tree stems, chilled dew on a leaf, and the leaf buds swelling on your Japanese maple in preparation for spring. This is good for our spirits and our minds.